I am seriously into estate sales. They are so much better than either garage sales or thrift stores. If you are as thrifty and as into cool, old things as I am then estate sales are like the mac daddy of shopping excursions. But I feel like people are intimidated by them. They don’t know how to find out about them, or they’re nervous about the idea of shopping inside someone’s house, or maybe the idea of picking through a deceased person’s belongings freaks them out. Have no fear. I’m going to assuage all of your concerns. First up, I signed up for emails ages ago on estatesales.net (they don’t know me and this is not a sponsored post, though I wish it was!). The folks who put on estate sales (usually private companies who specialize in just that) list them with estatesales.net and every week I get an email letting me know about the sales going on in my area. For many of them I can even click through to the website to view details and photos. Looking at the photos and location definitely helps me get an idea of whether a sale is worth my time. If it’s full of fancy antiques then chances are most everything will be too rich for my blood. And if the sale is in a very new neighborhood or in a condo then it’s pretty unlikely that there will be a large selection of vintage whatnots as the deceased probably already downsized when moving to that home. 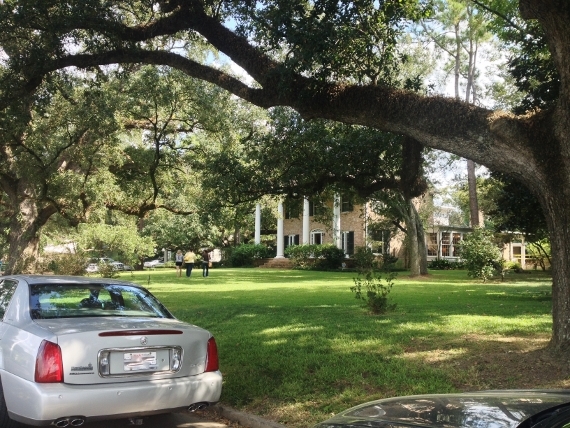 I wasn’t so sure about heading to this particular sale as it was held in a giant house on the LSU lakes and I worried it would be too fancy, but my friend Cassie scoped it out the day before and let me know that there was plenty of good stuff. The sofa below was only $250, marked down an additional 50% off because it was the last day of the sale. $125 for an antique sofa? I mean come on. It doesn’t get much better than that. Which brings me to my next tip: sales usually last 2-4 days. If you’re looking for something specific, go early on the first day. If you’re looking for bargains, go early on the last day. For a three day sale items are usually full price on the first day, 25% off on the second day, and 50% off on the third day. And if love of sleep has kept you out of the garage sale circuit then you can breathe a sigh of relief: “early” for an estate sale means 9am at the very earliest. Sometimes they don’t even open until noon! You can check the times for the sale you’re attending on estatesales.net. 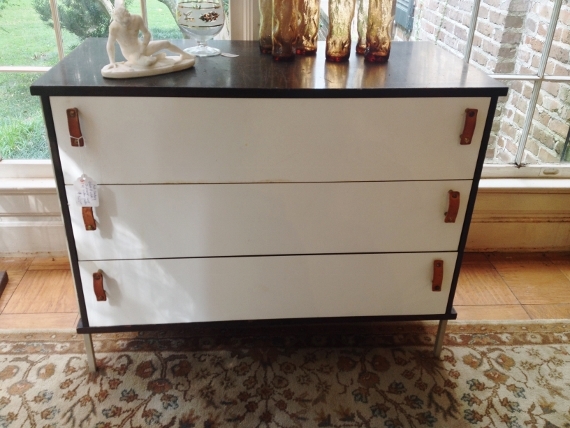 The mid-century modern chest of drawers above was marked $325. Since I was there on the last day I could have snagged it for about $160. And this huge ottoman below was only $40 ($20 sale price). I was very, very tempted to bring it home and reupholster it, but I was there to shop for etsy inventory so I kept walking. The third question I hear often is twofold: isn’t it weird to be inside a stranger’s house/isn’t it weird to pick through a deceased person’s belongings? These are legitimate questions, but in all honesty it’s just not like that. Usually the family has already taken everything that’s meaningful to them, then the professionals come in and remove any remaining personal items before sorting and pricing everything. The furniture is rearranged to best display the items for sale, so instead of a bedroom you’re now standing in a room lined with folding tables covered in fabulous treasures. 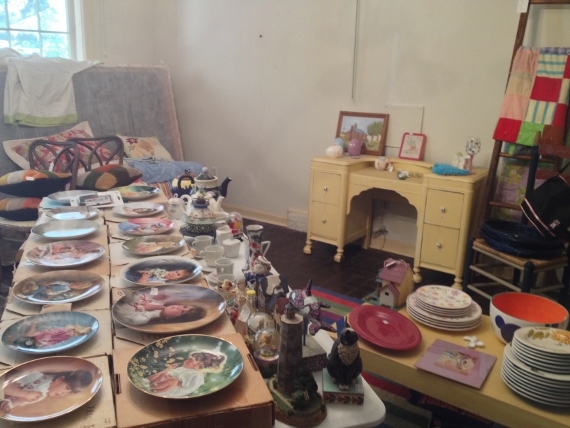 I went to an estate sale once that was not run very professionally–there were personal items still out (photographs on the walls, take-out menus on the fridge, etc.) and the staff were all sitting in the living room hanging out. It felt like we were intruding. The vast majority of sales are not like that. There’s usually a table set up near the exit with folks working as cashiers and the more organized companies even have bins set up near the checkout where you can place your selections as you continue shopping. If you’ve got your arms full a staff member may even offer to take your items to a bin for you while you shop! There are usually newspapers and plastic bags at the checkout for you to wrap up fragile items. If they’re busy there may be a staff member wrapping items to keep the line moving, but you should be prepared to wrap them up yourself otherwise. Also, if you want to buy something that’s too big to carry just grab the tag and bring it with you to the checkout. You can usually arrange to come back and pick it up later if you don’t have a way to get it out right then. For most sales you will need to provide your own labor for moving heavy items, so recruit a couple of strong helpers if you’re in the market for a china cabinet. At this particular sale I was looking only for small items I can sell in my etsy shop. I came away with twelve small plates, a pair of pink depression glass soup bowls, and two silver plated serving dishes. Total: $48. That means I can list everything in my etsy shop at a reasonable price and still turn a profit. Everybody wins! But if you, like me, prefer the thrill of the hunt then definitely check out an estate sale in your town sometime. If you start attending them regularly you’ll get a feel for which companies and neighborhoods you prefer (in BR I love Mitchell Weeks sales and houses in the garden district/mid-city tend to have the coolest stuff). Thanks for reading, and if you’ve been nervous about checking out estate sales in the past I hope you’re now feeling more confident! This looks like fun, but around here, I don’t think they have estate sales. We have estate auctions. They are fun, but if you just want a few things it can take most of the day just for them. Usually small things go first and it will end with big items like furniture or cars. Sometimes it is not worth giving up the whole afternoon. We have estate auctions, too, but I’ve never been to one for exactly that reason. You should check out the website and see if there are any sales in your area that you didn’t know about ! I love estate sales. Yes I conduct them too, but I also shop at them, especially when I travel. You’re so right, it’s a win/win for everyone!